Vote for your favorite track this week on AWA! Hey folks! 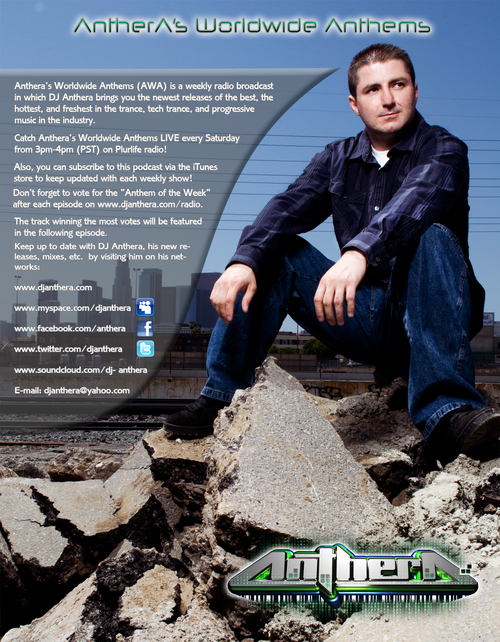 This is where you can interact with the tracks I play on "Anthera's Worldwide Anthems" (AWA) each week. 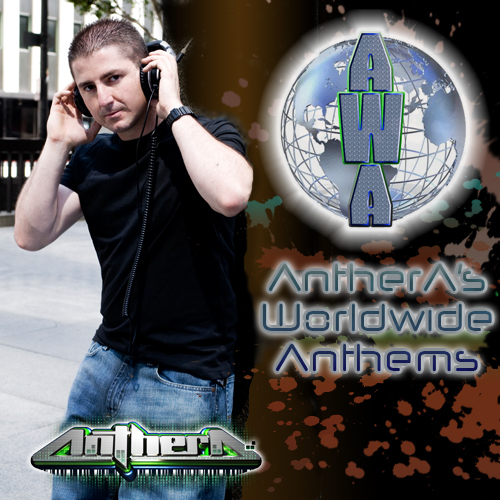 "Anthera's Worldwide Anthems" (A.K.A. : "AWA") is a FREE weekly podcast in which you can subscribe to on iTunes. It is the podcast in which I bring you the newest releases of the best, the hottest, and freshest in the trance, tech trance, and progressive music in the industry. Finally, after months of anticipation, we have finally made it possible to subscribe to and download Anthera's Worldwide Anthems as a podcast. Every episode I've ever done (minus a couple due to technical difficulties) can be downloaded from your iTunes and right onto your iPod!! This new podcast feature will allow you to listen anytime during the week, to make it more convenient than having to catch it live. This will hopefully make it easier for those of you to cast your vote for your "Track of the Week", considering you can take the episode with you anywhere, as opposed to having to be in front of your computer to catch the live show that AWA used to be (just make sure you don't forget to vote! VERY IMPORTANT!). The page with my channel and podcasts will appear. Simply hit subscribe, and AWA will be updated automatically to your iTunes and to your iPod (depending on your sync settings). So right here on this page, you'll find tracklists for those episodes, well as the voting polls so you can vote for your favorite tracks that I play during the episodes each week. The top voted track will receive the "Anthem of the Week" award, and will be played the following week. Polls will open as soon as the episode is available. Polls will close Thursday night at 11:59pm (this gives me enough time to tally the votes and coordinate the following podcast accordingly).